Things are finally looking up for Blackpool on but more importantly off the pitch these days. A High Court ruling in February saw the club put into receivership, but crucially, it led to the removals of ex-owner Owen Oyston and his daughter Natalie Christopher from the board. The end of the Oyston family’s reign led to Tangerines’ fans ending their four-year boycott of Bloomfield Road, as they came flooding back, with over 15,000 watching the 2-2 draw against Southend, up by over 11,000 from their previous home match. Over 7,000 and 8,000 then attended the Doncaster and Plymouth matches as Pools’ fans can finally watch their side in action once more. The recently-appointed board have had the opportunity to review their financial situation before the EFL decides on April 11 whether an insolvency penalty is required, as such a breach could result in a 12-point deduction. However, another positive piece of news, saw joint receivers Paul Cooper and David Rubin reveal they have had at least 59 expressions of interest in buying the club. If they aren’t hit with a points deduction, then Blackpool could still figure in the play-off places, providing they can hit some form in the final six games. Sitting eighth and six points adrift of Doncaster, Terry McPhillips’ side have lost their way slightly at just the wrong time, after giving themselves every chance with a run of three wins and two draws earlier in the year. Two wins from 10 since has dropped them to outsides, with the manager setting a clear victory target needed to sneak in, saying: “Probably five, they’ve got a superior goal difference Doncaster and we’re going to Luton, so we’re realistic. Away from home, Blackpool have been impressive this season, especially since the turn of the year, winning at Portsmouth, Coventry, Accrington and Bradford, handing out a 4-1 hammering to the Bantams. They also held both Sunderland and Charlton in that time, going five matches without defeat at one stage, until thrashed 4-0 at Bristol Rovers. The Tangerines also lost at Burton, but recovered to convincingly see off Bradford in their last away clash. In total, they have managed seven wins on their travel, equalling their number of victories at home, although they have only scored 19 goals in 20 games, away from Bloomfield Road, conceding 22. Defender Marc Bola knows his side are in for a difficult ask at Kenilworth Road, saying: “We played them near the beginning of the season and they were tough, probably one of the toughest games that we’ve played. “It’s not a surprise in terms of what they can actually do on the pitch, but with how tough the league is and to go without losing is pretty impressive. “Everybody knows that they’re a good side, but we’re also a good side and we can back ourselves. They’re on a good run, but every game is different. Hopefully we can perform well. Team news: Luton have striker Danny Hylton back in contention for the match, while on-loan Brighton attacker Aaron Connolly is also available. Alan McCormack (hamstring) is still rated doubtful, with Glen Rea (knee) and Dan Potts (knee) both missing. Blackpool have confirmed they will be without Jimmy Ryan, Max Clayton and Mark Howard. Milestones: Luton will set a new club record of 28 league games without defeat if they remain unbeaten at the weekend. Top scorers: Hatters: James Collins (24). Blackpool: Armand Gnanduillet (14). Man in the middle: Lee Collins – has taken 21 games so far, showing just 67 yellows and one red. Refereed Town once last term, the 3-1 win over Forest Green Rovers in April, while had Luton’s 3-0 win at Plymouth on the opening day of the 2016-17 campaign harshly sending off Dan Potts for two bookings in the final minute. Officiated two Luton clashes in the 2014-15 season, home wins over Tranmere and Accrington. Assistants referees are Justin Amey and Carl Fitch-Jackson, with the fourth official Stephen Brown. In charge: Terry McPhillips, 50-year-old, who began his career with Liverpool and then played for Halifax Town, Northampton Town, Crewe Alexandra and Nantwich Town. Appointed academy director at Crewe Alexandra in 1992, spending 14 years at the club before joining the academy staff of Blackburn Rovers in 2006. Led Rovers to the 2012 FA Youth Cup Final, named caretaker assistant to Gary Bowyer in January 2012, a position he also held between June 2013 to 2015. In 2016, followed Bowyer to Blackpool as chief scout and number two, taking over temporarily in August when Bowyer left, given the position permanently a month later. View from the opposition: Terry McPhillips talking to the club’s official website - “Nathan Jones has done a great job and he’s since moved on, but Mick (Harford) has come in and kept the momentum going. “It is difficult to come in and keep things ticking over, as I know. “I think it’s a bit different with Luton because they were already on a great run but they are the best team we’ve played this season, for sure. “We got a 0-0 at home but they played some lovely football. They’ve got some powerful athletes and they’ve got goalscorers. But they’ve got to lose at some point and hopefully that will be on Saturday. “They’ve got terrific players and they’ve got a system they stick to and it works for them. “We’ll all be believing we can win but we’re not stupid, they’re on this run for a reason – they’re the top team in this league. Friendly faces: Blackpool striker Mark Cullen was signed from Luton for £180,000 in July 2015 after playing 83 times, scoring 24 goals for the Hatters. Netted 26 goals in 108 games for the Tangerines but was loaned to Carlisle on transfer deadline day and has played six times for the Cumbrians, not scoring yet. Luton defender Alex Baptiste joined Blackpool in July 2007 from Mansfield and went on to play 190 times for the club, including 22 appearances when the Tangerines were in the Premier League during the 2010-11 season. Left in July 2013, heading to Bolton and had spells with Blackburn, Middlesbrough, Sheffield United, Preston, QPR, joining Luton on loan on deadline day. Defender Lloyd Jones had two loan stints at Bloomfield Road in the 2015-16 season, while with Liverpool, making nine appearances in total. Played for both: Kevin Foley. Irish defender who came through the ranks at Kenilworth Road, making 166 appearances and scoring five goals between 2002-2007. Left for Wolves in August 2007 for an undisclosed fee, featuring almost 200 times for the Molineux club. Towards the end of his time with Wanderers, went to Blackpool on loan twice, playing nine games in the Championship. On his release from Wolves, Foley, who won eight caps for Ireland, went to Copenhagen, Ipswich, Charlton, Coventry and also had a spell at Billericay Town. One to watch: Armand Gnaduillet. After spells with Chesterfield, Tranmere, Oxford, Stevenage and Leyton Orient, the imposing striker appears to have settled well in Blackpool. Scored six in his first season and just five in League One last term, while although took time to get going again this campaign, did eventually find some form. One goal in his first 11 games was then followed by eight in his next 15 as he was finally a regular on the scoresheet. Has scored just six since December 22, but did grab a double in the 4-1 win at Bradford recently, making it 14 for the season. We’ve got form: Luton have an excellent record against Blackpool at Kenilworth Road since their first clash in Division Two, back in 1897. They went 60 years without defeat, until a 2-1 reverse in 1957, also winning six in a row between 1978 and 1999. A 3-1 defeat punctured that run in 2003, but that’s Town’s only defeat since 1972, sequence spanning 15 games. In total, Luton have won 16, drawn six and lost just four, scoring 50 goals and conceding 29. Last time out: Luton suffered play-off heartache at the hands of Blackpool when they last visited Kenilworth Road in May 2017. With the Hatters trailing 3-2 from the first leg, they fell behind when Nathan Delfouneso scored on 22 minutes. However, Kelvin Mellor deflected in Alan Sheehan’s shot and then Scott Cuthbert flicked a header into the net to make it 2-1 at the break. 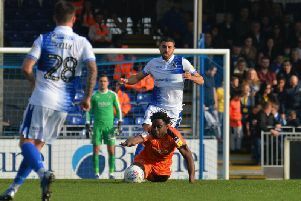 Danny Hylton’s penalty saw Luton 3-1 in front, before Armand Gnanduillet netted with 14 minutes left and Stuart Moore’s own goal in the final seconds saw the Tangerines draw level, going through 6-5 on aggregate. Hatters: Stuart Moore, James Justin, Dan Potts, Scott Cuthbert, Alan Sheehan, Glen Rea, Pelly-Ruddock Mpanzu, Olly Lee (Jordan Cook 82), Lawson D’Ath, Danny Hylton, Isaac Vassell. Subs not used: Craig King, Stephen O’Donnell, Jonathan Smith, Luke Gambin, Jack Marriott, Ollie Palmer.